Retro is in. So is Timeless. 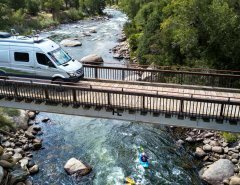 And the teardrop is high on the list for searches for convenient, small and versatile travel trailers. This article and review was originally published in 2009, but the industry and demand for this take-anywhere and tow-by-car or small SUV travel trailer is still hot and top on the search lists. 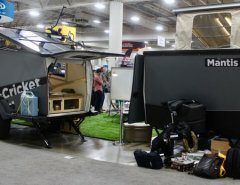 Little Guy says the camper trailers “are just the right size: as comfortable to sleep in as your own bed, with models available with full, queen, and king size mattresses. Little Guy Teardrop Camper Trailers are easy to tow with virtually any vehicle.” Each trailer comes equipped with a mattress, overhead cabinets and a galley. Available with graphics in virtually any color. combination. We show 3 series from the Little Guy model range below – the 4-wide, the 5-wide and the 6-wide series. The Little Guy 4-Wide Retro and Platform models have the Classic teardrop shape. They have a fiberglass exterior with custom graphics. Other features include locking double entry doors with slider window and screen, a rear locking hatch provides access to the galley, a large roof vent, aluminum alloy wheels, aluminum fenders, carpeted interior sides and floor, vinyl clad headlinde (easy to keep clean), interior cabinets and lights and a full-size sleeping area. The Little Guy 4-Wide Platform Model Teardrop Camper Trailer also comes with a front mounted metal screen cargo area. The payload platform measures 48 inches wide by 16 inches deep, making it ideal for carrying all of that extra gear, an optional gas generator, or even a cooler or a couple of bicycles. Longer, wider and more room inside than the 4 series, the Little Guy 5-Wide Retro and Platform models once again, have the Classic teardrop shape. They have a fiberglass exterior with custom graphics. Other features include locking double entry doors with slider window and screen, a rear locking hatch provides access to the galley, a large roof vent, aluminum alloy wheels, aluminum fenders, carpeted interior sides and floor, vinyl clad headliner (easy to keep clean), interior cabinets and lights and a full-size sleeping area. The Little Guy 5-Wide Platform Model Teardrop Camper Trailer also comes with a front mounted metal screen cargo area. The payload platform measures 60 inches wide by 16 inches deep, making it ideal for carrying all of that extra gear, an optional gas generator, or even a cooler or a couple of bicycles. The interior of the 6-wide series is 6′ providing maximum interior space – including a king-size matress. The platform model has a 6’x16″ platform while the sport model has a 5′ deep platform with loading ramps. The payload for the sport model is 1000 lbs! Once again, t he Little Guy 6-Wide Retro and Platform models have the Classic teardrop shape. They have a fiberglass exterior with custom graphics. 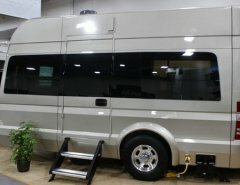 Other features include locking double entry doors with slider window and screen, a rear locking hatch provides access to the galley, a large roof vent, aluminum alloy wheels, aluminum fenders, carpeted interior sides and floor, vinyl clad headliner (easy to keep clean), interior cabinets and lights and a full-size sleeping area.